WVS 6 data-set was released at 2014 WVS Global Conference “Values and societies between stability & change” that took place at Qatar University (Doha, Qatar) on April, 27-29, 2014. Surveys within WVS wave 6 were conducted in 2010-2014. This wave covers nearly 60 countries and is the biggest wave in the history of WVS. Fieldwork for the sixth wave was finished on April 30, 2014. Wave 6 questionnaire except for measuring standardized set of issues (support for democracy, tolerance to foreigners and ethnic minorities, support for gender equality, the role of religion and changing levels of religiosity, the impact of globalization, attitudes toward the environment, work, family, politics, national identity, culture, diversity, insecurity, subjective well-being, and etc.) includes also innovative batteries of items on such topics like human security, electoral integrity, and aging, as well as maintaining continuity with the series of items on social, economic, religious, and political values established since the founding wave. 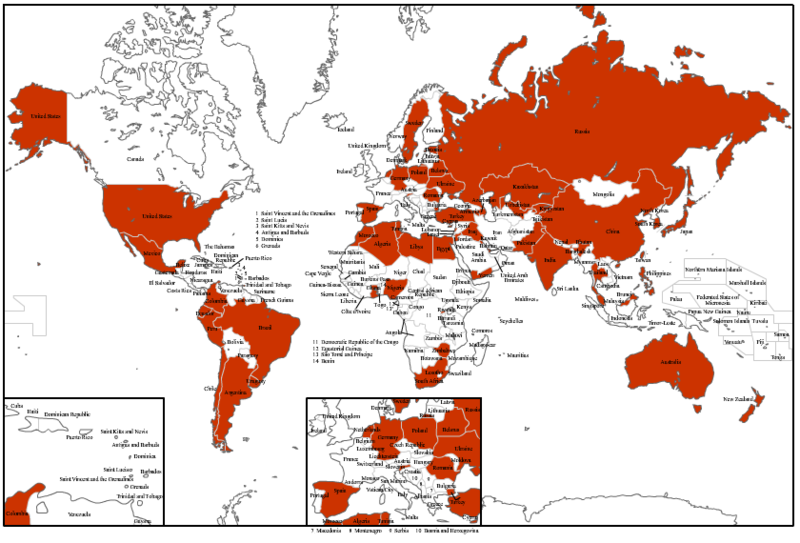 Countries covered by WVS wave 6: Algeria, Argentina, Armenia, Australia, Azerbaijan, Bahrain*, Belarus, Brazil, Chile, China, Colombia, Cyprus, Ecuador, Egypt, Estonia, Germany, Ghana, Hong Kong*, India, Iraq, Japan, Jordan, Kazakhstan, Kuwait, Kyrgyzstan, Lebanon, Lybia, Malaysia, Mexico, Morocco, Netherlands, New Zealand, Nigeria, Pakistan, Palestine, Peru, Philippines, Poland, Qatar, Romania, Russia, Rwanda, Singapore, Slovenia, South Africa, South Korea, Spain, Sweden, Taiwan, Thailand, Trinidad and Tobago, Tunisia, Turkey, Ukraine, United States, Uruguay, Uzbekistan, Yemen, Zimbabwe. With the new WVS wave launch we also start a new site plenty of new features. We have also revised all waves and documentation, in order to maximize available documentation of each sample. A redesigned online analysis section including time series, cartographical analysis and a simpler interface. A new documentation section organized by waves, with documentation at the country level or aggregated level. A new publications section allowing to easily locating any book or chapter using WVS data. A centralized participant network with links to the participant's personal or institutional pages. Most aggregates can now be downloaded in new alternative formats including SPSS Sav, Stata DTA; Stata ASCII + .DO file, Ascii delimited with coma, and R Workspace. Next month we will publish the set of files compatible with the Integrated Dictionary standard defined by EVS and WVS, and also the WVS 1981-2014 longitudinal aggregate. In November we will publish a new release of files including Argentina, Brazil, Hong-Kong, India, South-Africa and Thailand. Click the link below to download a quick reference to the new interactive features.